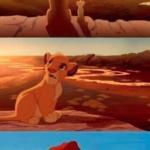 SIMBA EVERYTHING THE LIGHT TOUCHES IS OUR KINGDOM; WHAT ABOUT THAT SHADOWY PLACE OVER THERE? 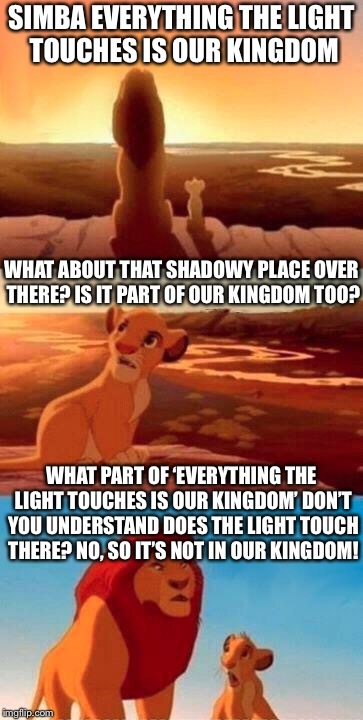 IS IT PART OF OUR KINGDOM TOO? WHAT PART OF ‘EVERYTHING THE LIGHT TOUCHES IS OUR KINGDOM’ DON’T YOU UNDERSTAND DOES THE LIGHT TOUCH THERE? NO, SO IT’S NOT IN OUR KINGDOM!